Hey guys! Hope you had a nice weekend (it was a long one up here in Canada!). We had such a nice relaxing 3 days at the family cottage in the adirondacks with our pals. Exactly what the Doctor ordered! Feeling well-rested and caught up on a few things. So back to the nursery where we left off last week. There are three major pieces of furniture we knew we were going to need to buy for our nursery/office: the desk (we picked that out here), a crib (yet to buy), and a dresser. 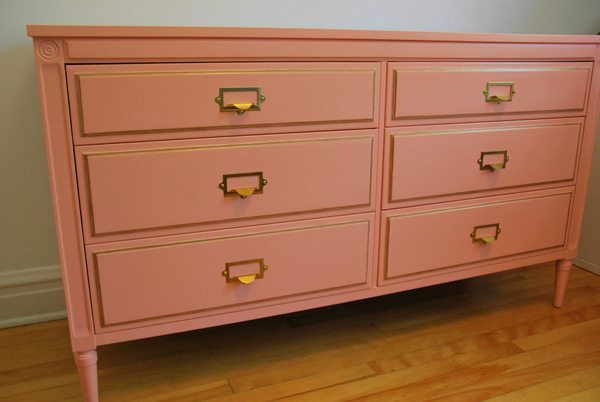 I knew I wanted a solid dresser that I could customize, so I started trolling the used sale ads (Kijiji, Craigslist, etc) and thrift stores religiously. I had some fairly specific wants. 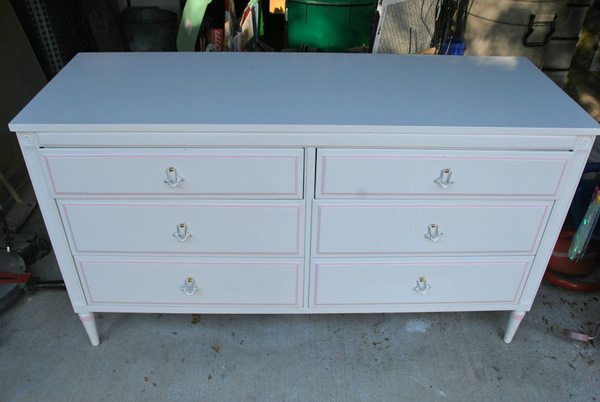 The dresser had to fit the area between our closet and desk — many were either way too long (most 6 drawer and 9 drawer dressers were too long) or too short – I didn’t want anything too small that wouldn’t take advantage of the space. 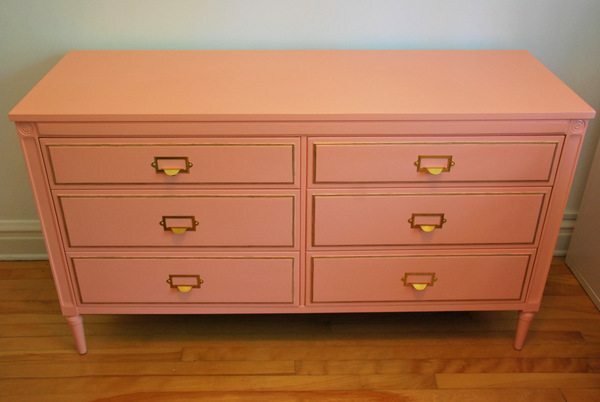 Secondly, I wanted something with clean lines that had nice legs to keep dresser from looking too bottom-heavy. Lastly, I was hoping to find something solid wood and well-made. After about a month of searching, this lovely creature popped up. It totally fit my specs, was on budget at $80. Winning! First step was to remove the hardware and give the whole piece a once-over with my palm sander. 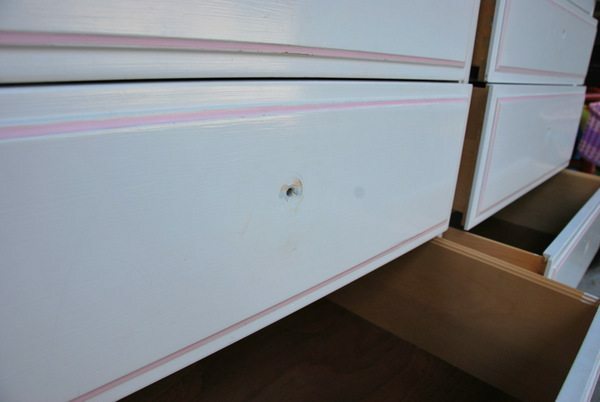 Then I grabbed my wood filler and filled in all of the holes from where the hardware was and a few little dings. I let that dry for about 24 hours before going back again with some sandpaper to smooth it all out. After a rub down with a wet cloth to make sure the whole thing was free of dust, I broke open the paint. The colour? 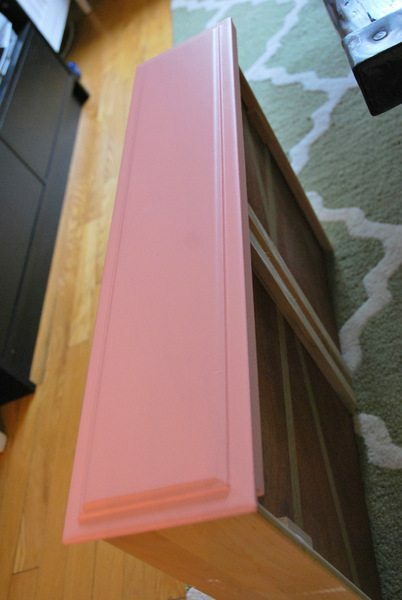 The same pink mistint that I used in the closet. 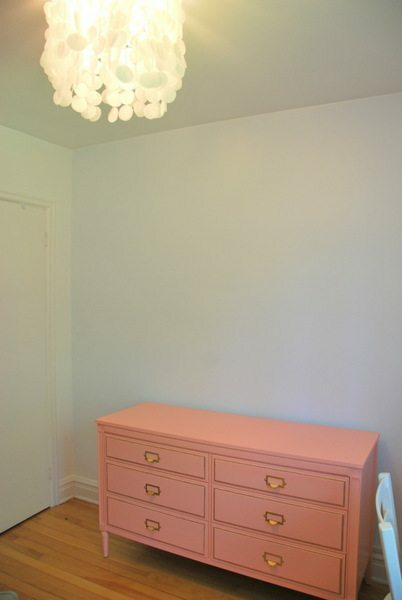 After seeing what a perfect shade it was, I was smitten and ready to use it on other pieces throughout the room. 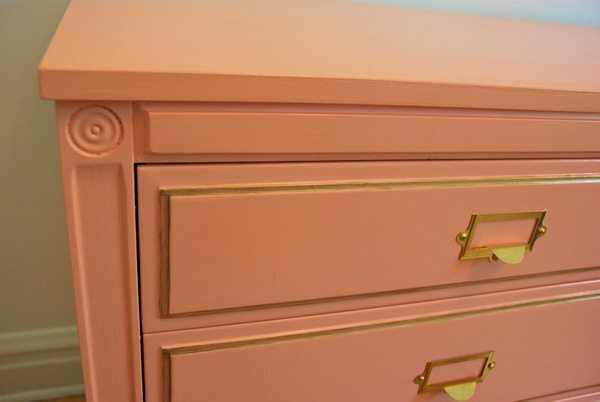 Plus, part of the reason for painting the room white was so that I could inject colour through the furniture. 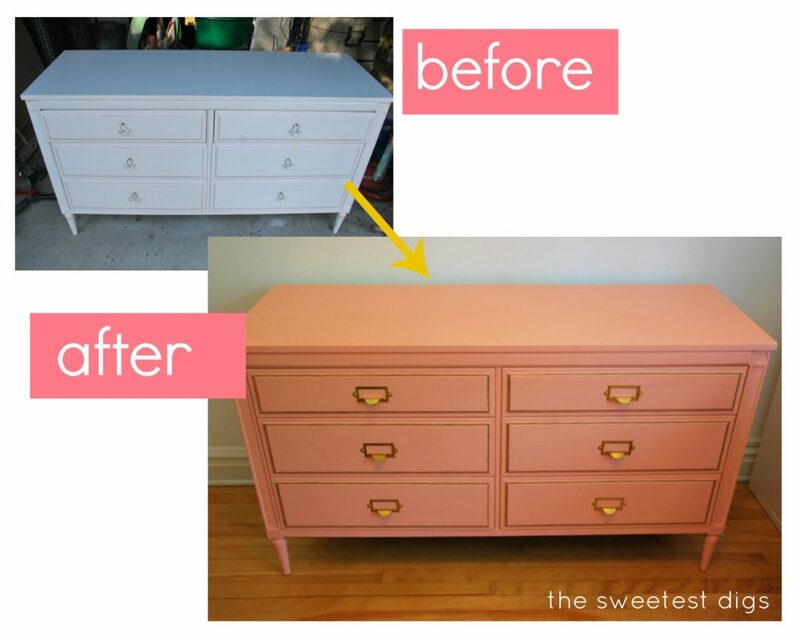 I gave the dresser and the drawers three coats to make sure it was all really well covered. I wasn’t stopping there though. 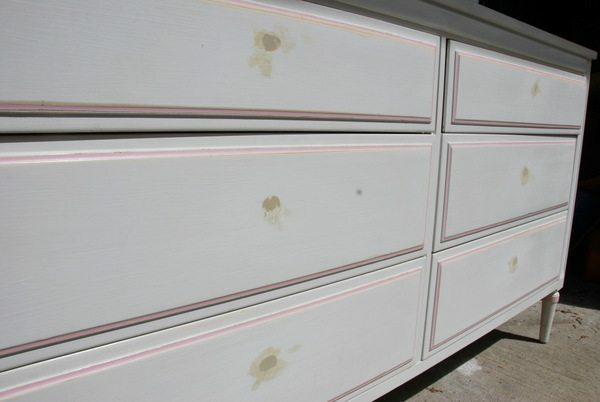 See the detailing on the drawer fronts? 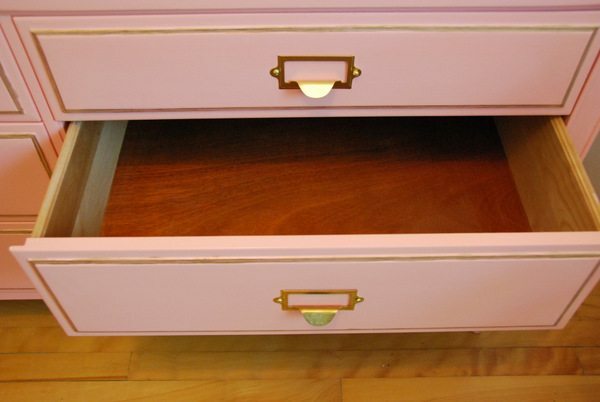 I thought it would be fun to highlight those by giving the drawers a gold border. 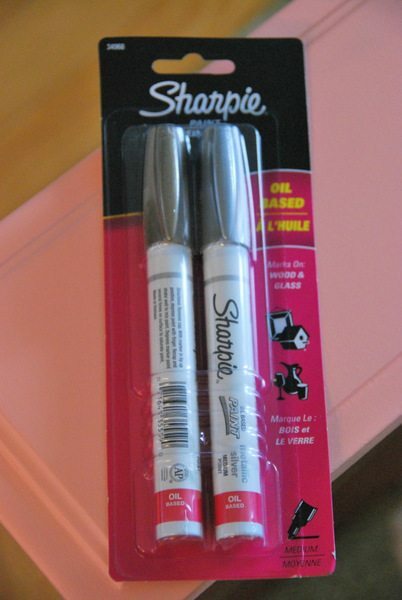 My first attempt was to try out these oil-based sharpie markers. I grabbed them from Michael’s when they were on sale a little while ago, thinking that they might be easier than paint when I want a little gold or silver accent. …once I got to the long edge, it was just way to tricky to keep it running smoothly. The paint would come out of the marker in big gushes and was really hard to control. So I gave up and covered up this disaster with some more pink paint. So attempt #2 was gold acrylic paint. The frustrating thing here was that the paint I had went on reaaaaally thinly. The first coat was barely visible, so I had to go over it 3 times. When you’re trying to keep a really precise line, having to do so many coats just ups the chances of little squiggles. 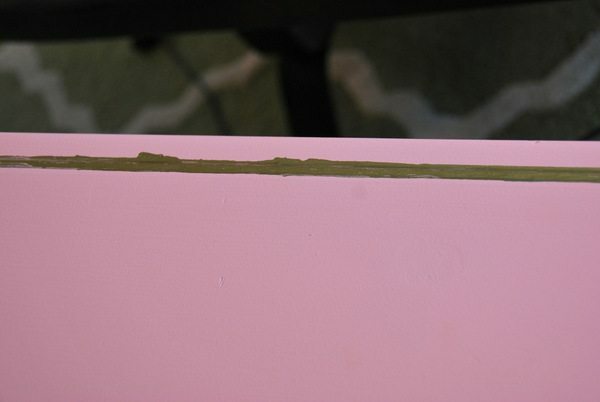 I could have put some painters tape down, but I was nervous about it pulling the pink paint off and just not getting a crisp line (and having to start from scratch again). 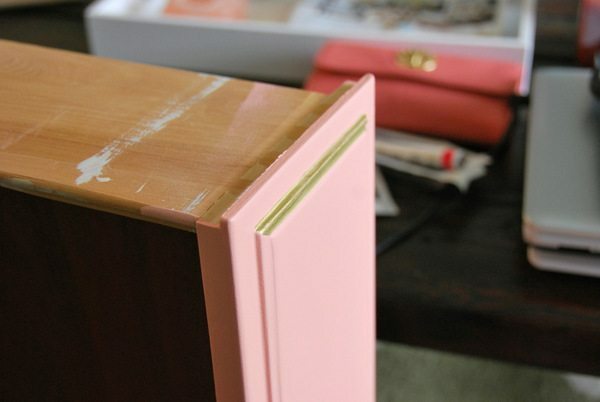 But I stayed patient and ultimately ended up with a pretty decent gold line along my six drawers. Sure there are a few spots that bug me, but when you stand back from the drawers you can’t really tell. The last step before re-installing some hardware and putting the dresser back together was to give the whole thing a few coats of varathane. 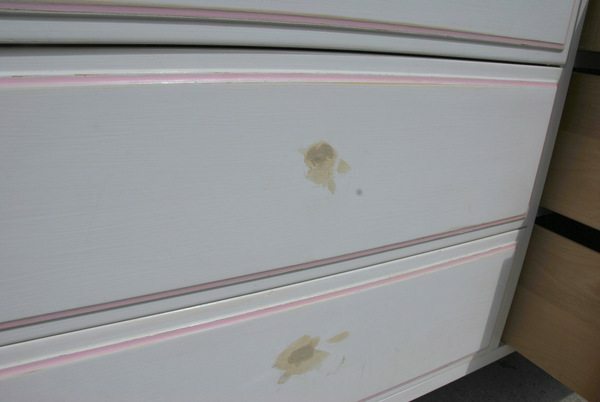 Because the top of this dresser will be used as a change table, and since I had only used regular wall paint (nothing high gloss), a layer of a protective sealant is really key. 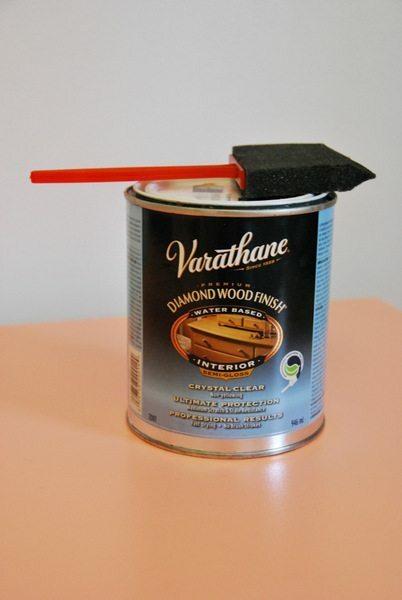 Two coats of this varathane (which I find to be totally non-yellowing) did the trick. 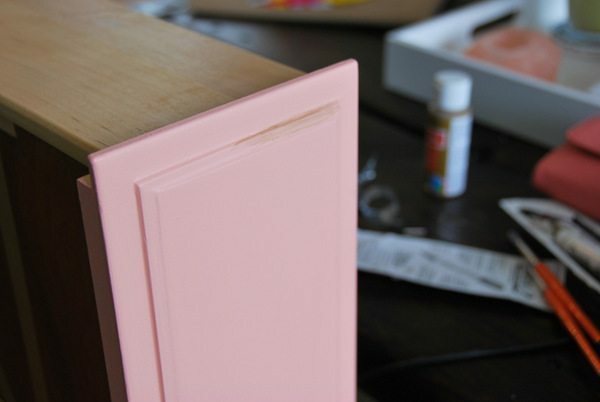 I usually apply with a simple foam brush and make sure to leave a good 3-4 hours between coats. Oh and do this outside as it’s stinky stuff. I wanted some fun brass hardware, so went to Lee Valley Tools (a Canadian store that carries a huge line of hardware, among other things) and browsed through the different pulls. I liked the look of some of the inset ones that you would see on campaign style dressers, and some simple brass rings, but ultimately decided on these rectangular ones. They reminded me of library drawers, and the fact that I could throw some labels in them sealed the deal (labels = my jam). We measured and marked each drawer so that they would all align and be centered. And then hubby came and helped me drill them in. They were flat head screws, which can be a little unwieldy to get in (I had a hard time keeping the drill from bumping around). 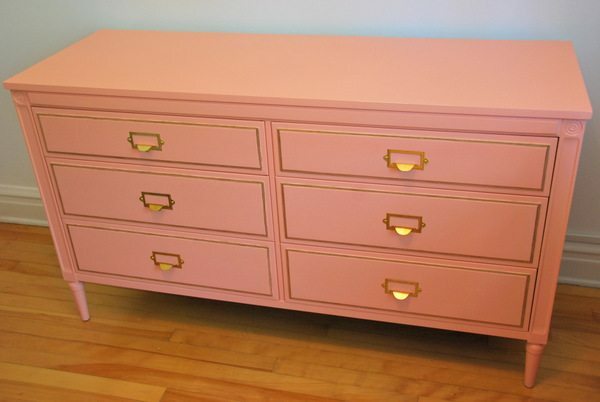 But once those were all in, I just slid those drawers into the dresser and she was a beaut! Seriously though, isn’t the pink + gold such a sweet combo? I’m smitten. 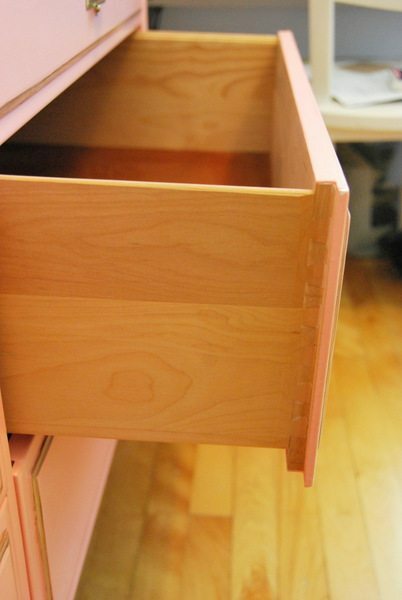 Oh and I forgot to mention that the insides of the drawers are pure mahogany (!!). I totally didn’t realize this until I was saying to my Mum that I might line them, and she quickly had a look and told me what great quality they were. And the drawers themselves are all dove-tailed. Again this is where buying used can be so great. The pieces are so solid and well-made compared to the mass manufactured stuff we often buy these days. And look at this great big blank wall space above the dresser. Can you say gallery wall? I’ve got plans, yo. 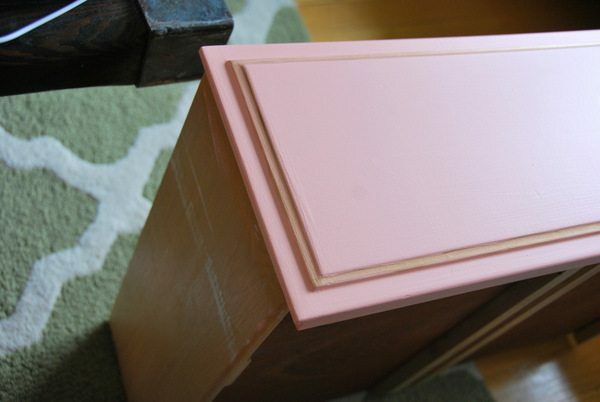 Have you guys made over a piece of furniture lately? I find I put it off, but once I get started I always realize what an easy transformation it really is. Plus, you can customize things to be exactly the colour and look you’re going for. 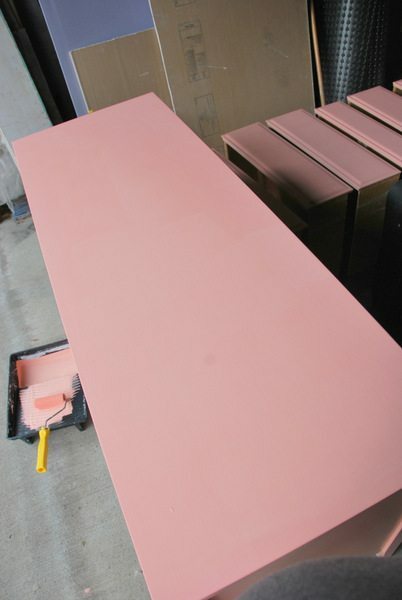 Got anything lurking in your garage or basement that’s waiting for a coat of paint? I know I do! Looks amazing, I love the pink and gold. Great transformation. Oh you’re so funny. I also say “yo” sporadically like you do. Reminds me that we’re both dorks! I love those Lee Valley handles, good thinking. On the whole gold thing…I wanted brass/gold handles for my kitchen cabs last summer. Well! No one sells minimalist brass handles. Either antique or ugly. 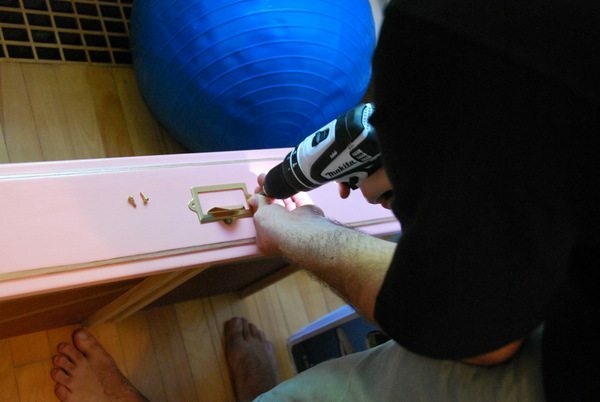 So i bought simple Ikea handles, then used a product I buy off ebay called “rub ‘n’ buf”. Check it out sometime. It comes in these tubes, and you can paint it on. I find it really hard to use though, like your marker or that paint. We need to find something perfect for giving things that gold look I think. PS: What does dove-tailed mean? Nevermind, I’ll google it to save time. But still, good lingo:) You are SO good at following through on projects. Carry this momentum pass baby, so many people use babies as an excuse to do nothing. I know you won’t, but it can be hard to start up with projects again. You’re my hero! Hmm.. yeah – we need to come up with something for sure! I haven’t tried gold-leafing before, but it’s on my to do list. Oh and dovetailing is when the joins in the wood are woven together sort of like puzzle pieces (rather than being two straight pieces of wood that are glued or nailed together). Definitely look out for it when you’re buying used pieces, as it’s a sign of really good craftsmanship. I did originally plan to do the gold detailing on the side, Amelia… great minds think alike! :) Once I realize what a steady hand I needed for the 3 coats though, I started to scale back. Haha! Awesome transformation! The pink and gold is a great combo. Love the drawer pulls from Lee Valley too. Thanks Amanda! It’s been really fun pulling the pieces together… can’t wait to get some art up on the walls! WOW! It is so beautiful!! Love it! This is adorable!! I’m LOVING the pink and gold combo. What a difference! Great job! It looks perfect for a baby’s room. Very nice. I love the style and color! So cute! I am featuring it tomorrow… Thank you for visiting our party! LURV this!! I found you through the 36th Avenue. So glad I did, your site is great! Aww – thanks so much, Stacey!! Found you over at the 36th avenue! 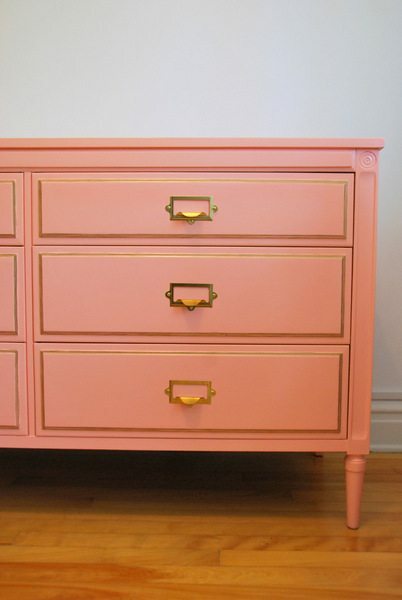 This dresser turned out amazing, congrats on the feature! I love the trim detail! Would love for you to stop by http://www.livingbettertogether.com! I love the color you chose! 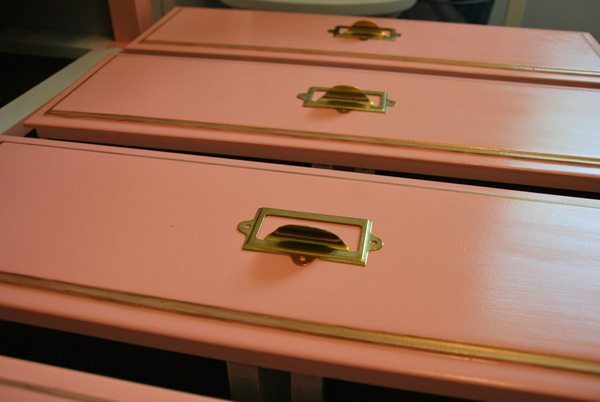 It’s so much richer than a standard pink. Great job! Hi .. The dresser is so beautiful !!! 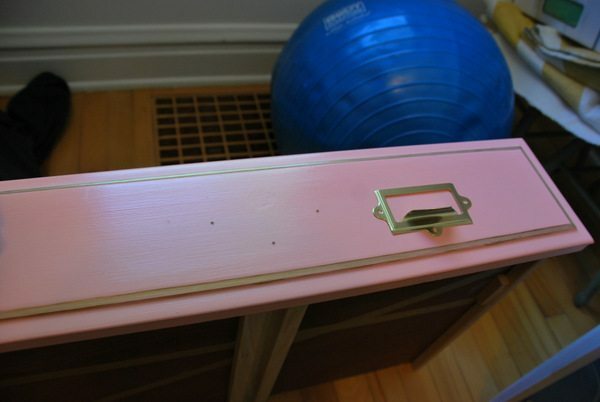 I’m trying to paint my daughters dressers from expresso to pink ! What pink did u used ??? It was a mistint that I picked up from Home Depot, so no paint name unfortunately. I would just go and pick out a bunch of swatches and then choose the pink you love! Good luck!